Welcome to Cut Up & Quilt! We're a friendly community gathering place where stitching enthusiasts like you can come feed your passion for quilting! We offer an extensive selection of high quality fabrics, notions, patterns, kits, and more, to inspire your creativity. We also have professional longarm quilters on hand to help you finish your projects. Located in Council Bluffs, IA, we're dedicated to providing quilters with a productive and enjoyable quilting experience through expert product knowledge, reliable service, personalized assistance, and ongoing support. Whether you're a quilting beginner or an experienced quilter who simply wants to indulge your passion for stitching...You're always welcome at Cut Up & Quilt! Directions to Cut Up & Quilt! Take exit 8 off of I-80 (same exit as IWCC). Turn West (toward Council Bluffs and Omaha). This is Hwy 6/Kanesville. 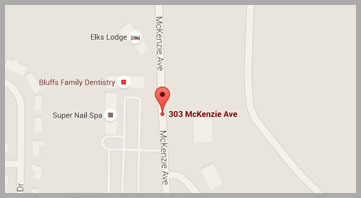 Go 1.8 miles to the stop light at McKenzie Ave.
We are across the street from Fareway and behind Auto Plus.